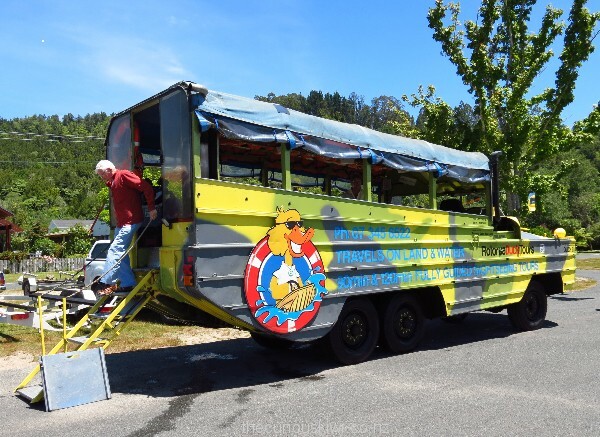 They’re yellow, they’re amphibious, and they’re really called ducks, or more precisely, ours was a 1944 GMC 6×6 DUKW. Ducks, as they became known, were initially used by the military in WWII. They’ve been modified for use in Rotorua and other cities around the world as commercial tour vehicles. And what do some ducks do? They quack, and we did too, courtesy of a yellow quacker handed out at the start of the tour. There are some things, quacking like a duck say, that you wouldn’t dream of doing. However put one enthusiastic ‘Conducktor’ in front of a duck load of strangers and before you know it you’ll be competing to be the quacking Queen, or King. The quacking has a purpose – to surprise pedestrians along the way. Many were surprised, they smiled, some laughed, and like Pavlov’s dogs we quacked some more. 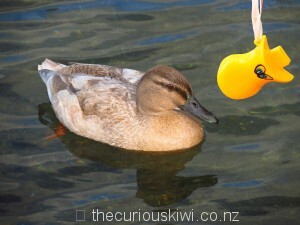 The first duck stop was the floating weed mat, doing its bit to clean the water in Lake Rotorua. Viewed from above the weed mat spells Rotorua, but you wouldn’t know it from ground level. Photographers may like the tree nearby that always seems to be full of shags. 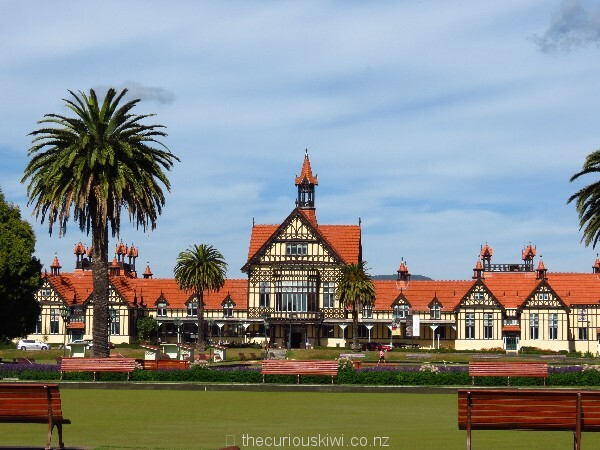 Next we rolled by the good looking Rotorua Museum and the art deco Blue Baths. The Blue Baths were the first place in the world to allow men and women to bathe together apparently, could come in handy in a game of Trivial Pursuit. After a quick look at steaming Sulphur Point we groaned over the hill on Tarawera Road. With a top speed of 60km/h ducks can barely break the speed limit, and it’s not unknown for them to be passed on the hill by cyclists, didn’t happen on our trip though. After a slow and rowdy ride we arrived at Lake Tikitapu (Blue Lake), and it was time to see if the duck could swim. 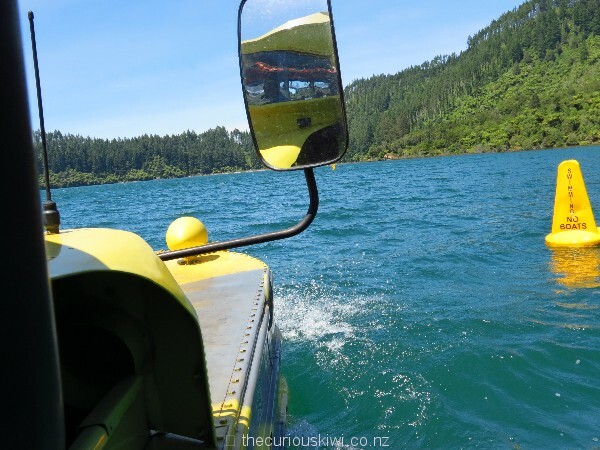 It’s unnerving driving into water, and I’d expected some mechanical drama to turn from a land based vehicle into a boat, but a couple of buttons were pressed and in we went. Ducks are driven by a propeller and the wheels act like a keel on a yacht to keep them stable. We puttered around the lake, quacked at some kids on a jet ski, and trailed our fingers through the cold, clear water. Lake Tikitapu is a really clear, clean lake owing to the lack of farms and houses in the area. The colour is partly caused by the pumice that sits on the lake bed. It’s a good spot to take the family and the popular Blue Lake Top 10 Holiday Park is opposite. Once out of the water the duck’s underside was checked for weeds before driving the short distance through a canopy of trees to sweet little Lake Okareka. 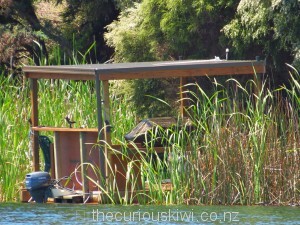 The shores of the lake are dotted with lovely homes, and one neat motorised BBQ pavillion. 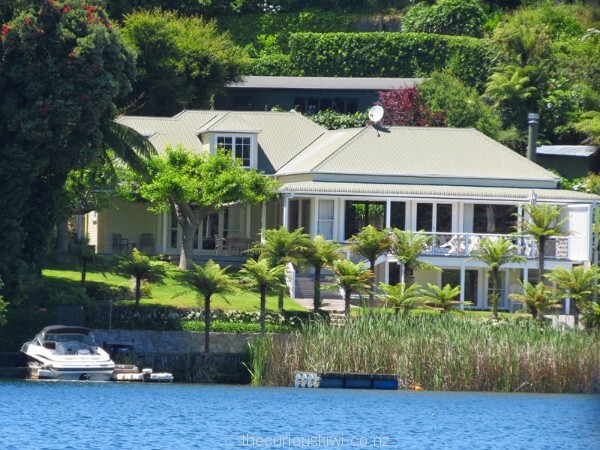 It’s also the location of the ultra luxurious Lake Okareka Lodge. The lodge can cost $15,000 a night in peak season, you do get the property to yourself if that’s any consolation. After floating around on Lake Okareka it was time for a photo stop. 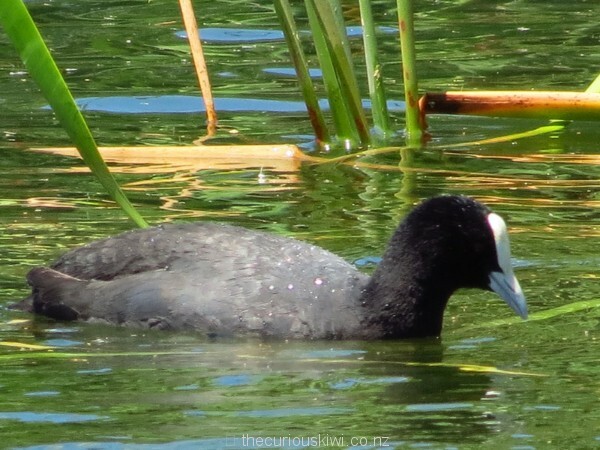 Birders may be lucky and see the rare New Zealand dabchick, there were no dabchicks on our watch but there were a flock of New Zealand scaups, and plenty of Australian coots. We had a quacking good time with Rotorua Duck Tours, our Conducktor Paulie was upbeat and informative, he seemed like someone who’d found his calling. 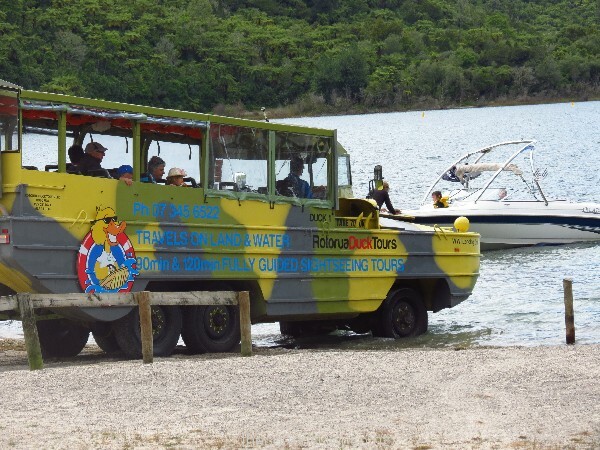 And we got to keep the quacker – entertaining people in Rotorua since duck tours began in 2003. 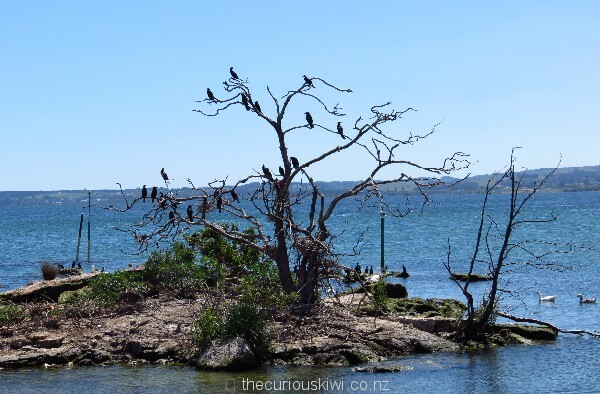 We did the 90 minute Rotorua City & Lakes Tour. There is also a 2 hour Tarawera & Lakes Tour. Dress warm, take a camera, and plenty of puff for the quacker. 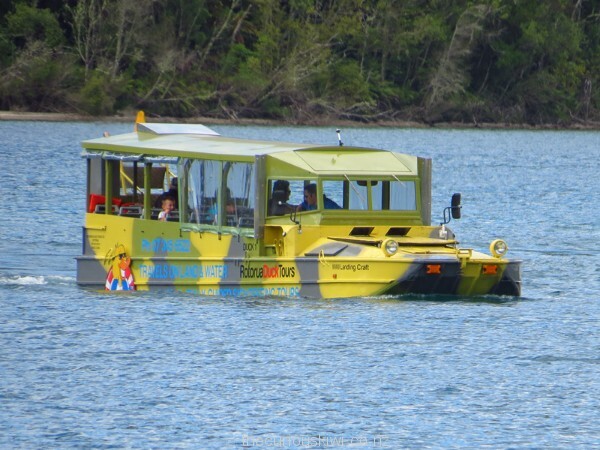 This entry was posted in Rotorua, Unusual New Zealand and tagged Rotorua, Rotorua Duck Tours by thecuriouskiwi. Bookmark the permalink.